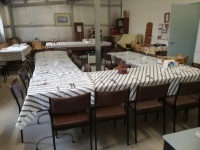 It is located at 42 Wimble Street (behind the golf club carpark) where there is adequate parking with easy access to the shed. 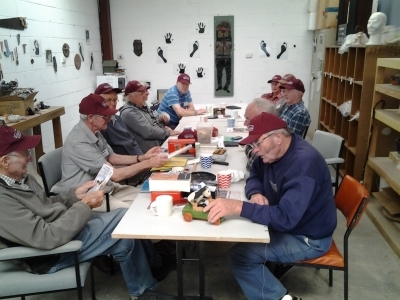 We were invited for a cuppa and a look around by the boys from Newstead. 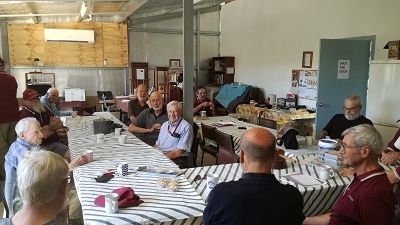 This took place on 26/2/2019 and was very enjoyable (and educational). 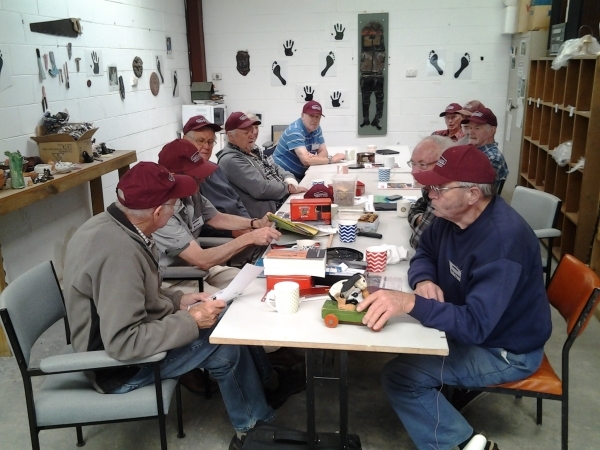 Friday 18th January, coincidentally the day of our friend Maree’s presentation, was made even more special with a visit from a number of our friends from Men’s Shed Kyneton. We exchanged experiences and details of operating procedures, all useful. Quite a large crowd in any case. 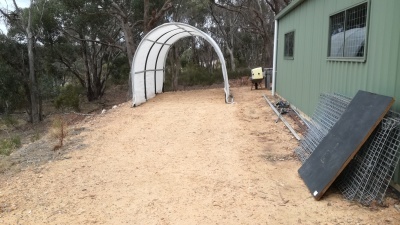 Preliminary work has begun on our planned wicking beds for growing vegetables at the shed. The top half of a covered waggon has been installed with a view to putting the garden beds underneath. Unsure as to how many waggon covers will be involved in the project, but it was good to see a beginning being made. 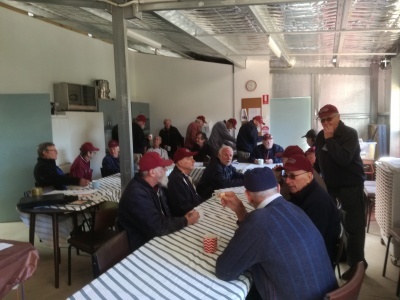 We arranged for a special cuppa to thank Bill Maltby for his assistance with the clearing sale held at Lindesay Hart's place. Bill really created a fine atmosphere despite early inclement weather. 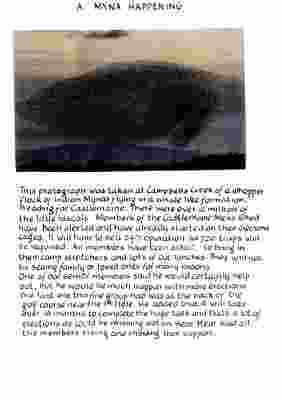 This helped to generate interest and meant that we were left with very little at the end of the day. Bill doesn't mind the odd drop of wine, so we were pleased to present him with a clutch of locally produced drops which Bill assures us will not go to waste. 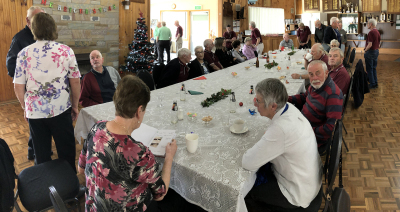 For our annual Christmas lunch for 2018 we again patronized the golf club. Once again it was done to perfection and enjoyed by all. ​To all our friends we wish the best for the coming year. 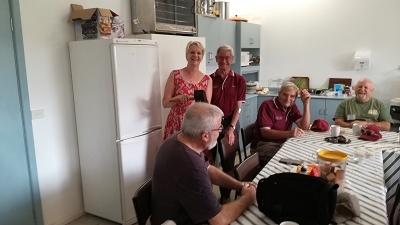 We have been waiting for a convenient time to present newly re-elected deputy speaker and local member (Maree Edwards) with her own edition of our shed shaped gavel. 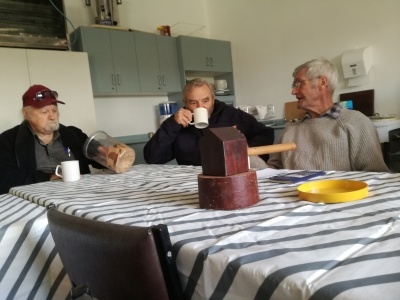 David Cooper is responsible for the development of this device, the effectiveness of which we can affirm due to the wielding of his own by our president Brian McCormick. 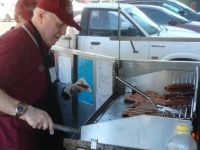 On the first Friday of each month, we have a barbeque lunch which usually consists of sausages and hamburgers with salad and bread. Sometimes there is even some sweets to finish off. The fee of $5.00 covers the cost involved. 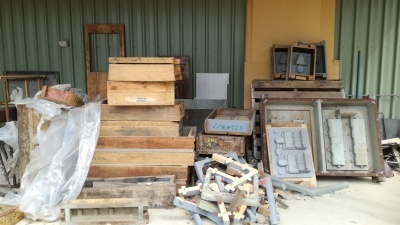 Thompsons Foundry gifted us some wooden patterns that were used to make an impression in the sand, to accommodate the molten steel during the foundry process. 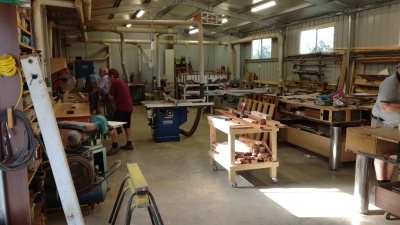 We do have members who were involved in the design and manufacturing processes around this, so we will keep some for display and use the rest as a source of quality timber. 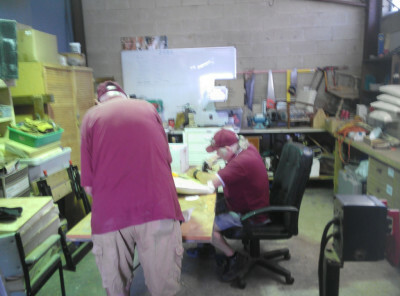 We expected to see an increase in numbers once we moved to a larger shed. The way things are going, we will need more seats. 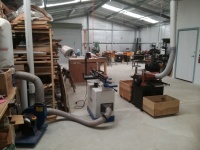 There are many projects underway, with construction of a second toilet and a welding bay also nearing completion. 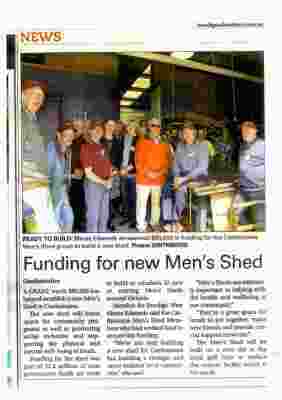 When we were planning the construction of our new shed, we did not think we would have sufficient funds to include these facilities. There is no doubt that we will need these things eventually, so it is nice to have them underway now. 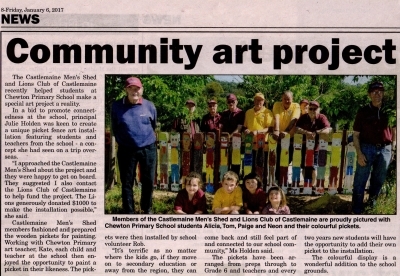 Many other things like the planting of native trees and making library boxes for Chewton Primary School are nearing completion. 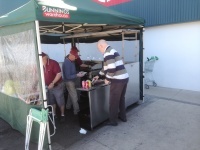 Our rostered sausage sizzle day at Bunnings at Kangaroo Flat came around last Friday (12th October 2018) and we had a keen team there early and ready to perform miracles in the sizzling arts. 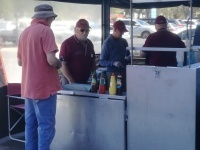 Unfortunately the customers didn't know about this and nothing much happened until after 10AM. Sporadic busy periods were the norm up to and after the afternoon shift arrived. Takings could have been better, but we won't turn our noses up at the final result. 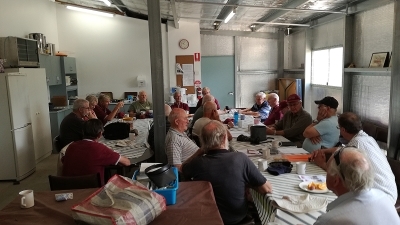 The beginning of Seniors’ Week saw a number of groups respond to a council invitation to mount a presentation in the Information Centre (old market building). 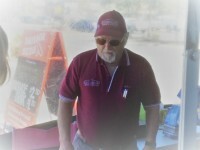 Rob McNabb took the bull by the horns and set up a table loaded with promotional material available for anyone attending who expressed an interest. Rob attended both days, and fielded such a number of enquiries, a reprint of brochures was necessary. aims we set for it, which was to make a start on the welding bay. This will allow welding indoors without any danger to eyes from the arcing involved. 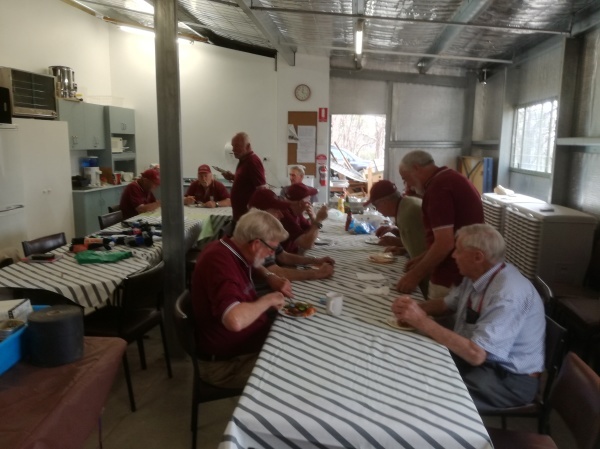 This is consistent with safety rules set by the Australian Men’s Shed Association, of which we are a member (also Victorian Men’s Shed Association). Group insurance cover is sourced through AMSA. 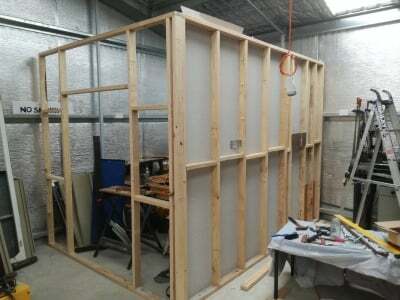 The photo is reminiscent of the scene inside the emerging shed when Kynan Sutherland and Jules Dewar were completing the interior framework. 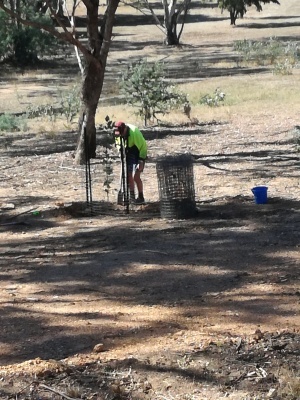 Doug McConville's Ironbark tree gets planted. 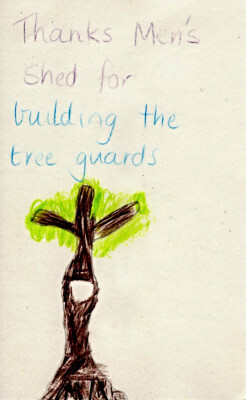 Some of his ashes will nurture the tree. We are blessed to have such a fine group of sponsors. We have overcome many problems together, some seemingly insurmountable. 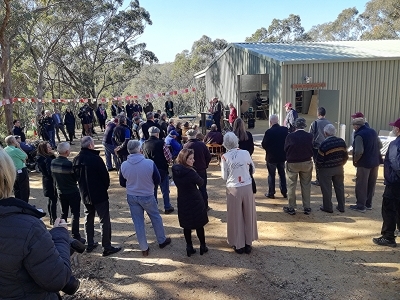 For example, seeding finance for start up was provided by Bendigo Bank Community Bank and a solution to the problem of a permanent ‘home’ was aided by the involvement of Maree Edwards MLA. We have constructed a ‘sponsor’ board at the approach to the new shed to proclaim our partners. 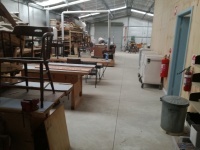 In the gallery below we have photos of inside and out of the new shed. I feel the spacious appearance is going to be tested over the near future, unless we are careful. Brian and his magnificently constructed gavel (pictured below) have come to the notice of important people. 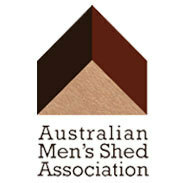 The gavel (constructed by David Cooper, in the form of the Australian Men’s Shed Association logo) is coveted by none other than the Deputy Speaker of the Victorian Parliament. 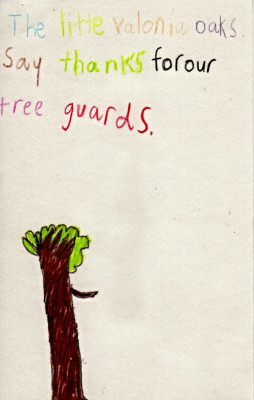 Maree Edwards. Over to you Mr Cooper! 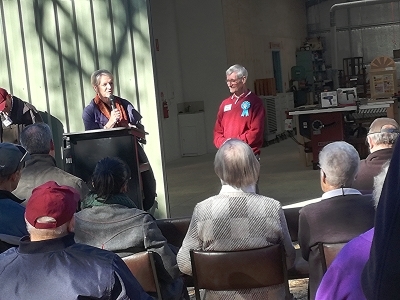 Castlemaine Men's Shed members and their Partners (both life and commercial) celebrated the commencement of building work on their new shed with a 'turning of the sod' ceremony on 10th March 2017. 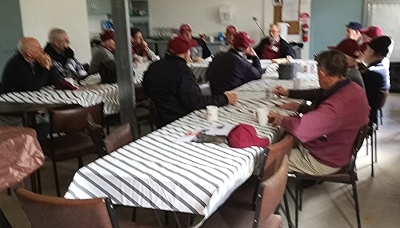 Held at the old 15th green shed site at Mt Alexander Golf Club, the function precedes foundation preparation. 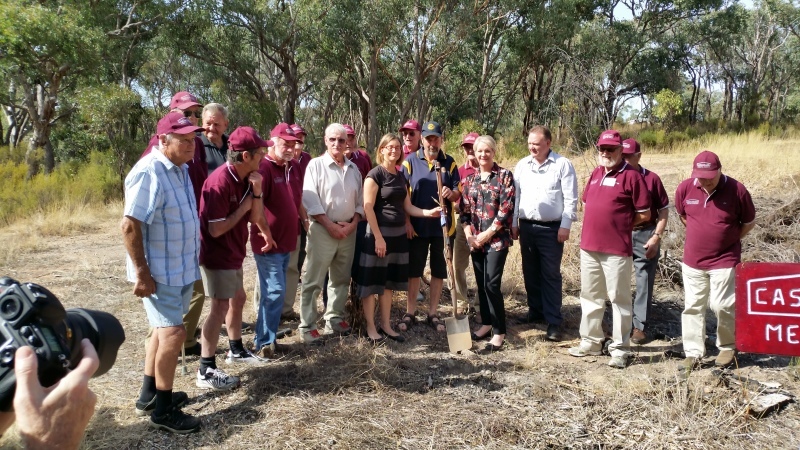 The well attended gathering featured fine digging performances (on David's one stringed base spade) by Maree Edwards MP a fine champion for our project. 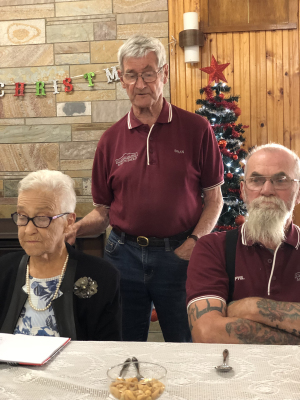 She was ably assisted be representatives of our Partners (see page 4) including Bendigo and Community Bank, Mt Alexander Shire, Rotary, Lions, FOMAD and Castlemaine Health. 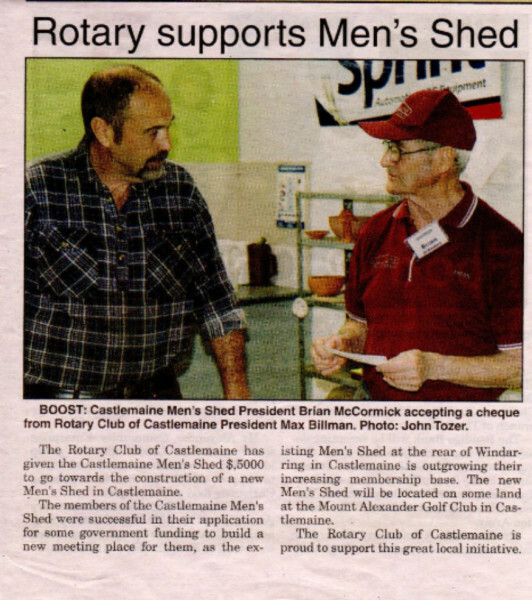 The mission of the Castlemaine Men’s Shed is to enjoy each other's company, promote self worth and values, while developing and sharing skills for the benefit of members of the community. 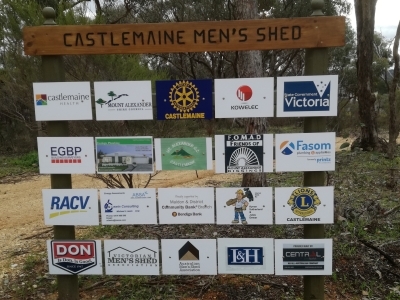 The Castlemaine Men’s Shed will cater for those men in the community who feel they want interaction with other like minded men and who wish to pass on their many work skills to others in a relaxed no-pressure environment. We were saddened to lose a longstanding member of our group, Lindesay Hart, on 16th July. As Lindesay had survived all relatives, we comprised most of the attendees at a simple ceremony, graveside at picturesque Vaughan Cemetery. Lindesay was a great contributor, with a wealth of stories, especially regarding building and racing cars in the UK. 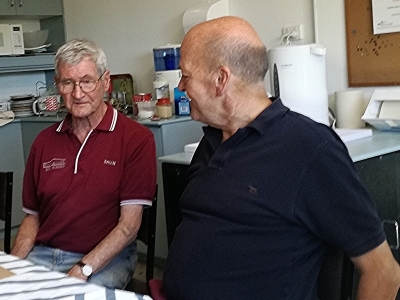 Even when he was restricted to a wheel chair, the tall fellow would attend on most Friday mornings to enjoy the company and the energy. 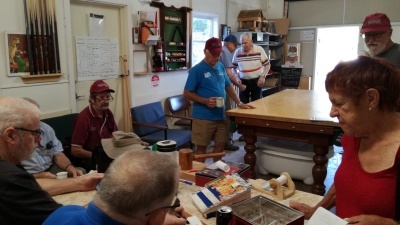 Becoming a member of a Men’s Shed gives a man that safe and busy environment where he can find many of the things he is missing, in an atmosphere of old-fashioned mateship. And, importantly, there is no pressure. 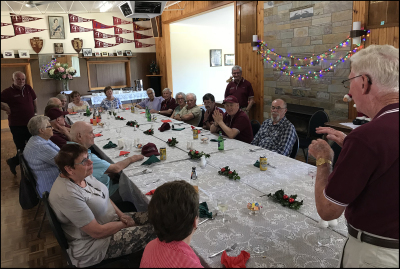 Men can just come and have a yarn and a cuppa if that is all they’re looking for. 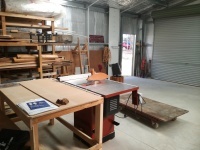 You will be able to use all of the machinery in the workshop after showing your ability to use said machinery in a safe and competent manner. 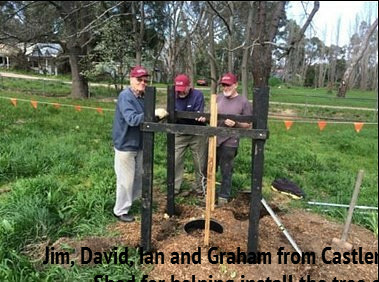 There will be the opportunity to work on your own projects, at any time, using your own materials or by making a donation for materials used from stocks held by the Castlemaine Shed.